By 1900 the renowned banker and philanthropist John Pierpont Morgan began to envision building a repository to house his collections and serve as a private retreat. He commissioned the celebrated architect Charles McKim of McKim, Mead, and White to construct an elegant marble villa next to his home on 36th Street between Madison and Park Avenues in New York City. Morgan was deeply engaged in the design of the building and the decoration of its interiors, which paid homage to the great Roman villas of the Italian Renaissance. Once the building was completed in 1906, Morgan effectively retired from Wall Street and began spending the majority of his time in his richly appointed library, continuing to embellish it with exceptional works of art. 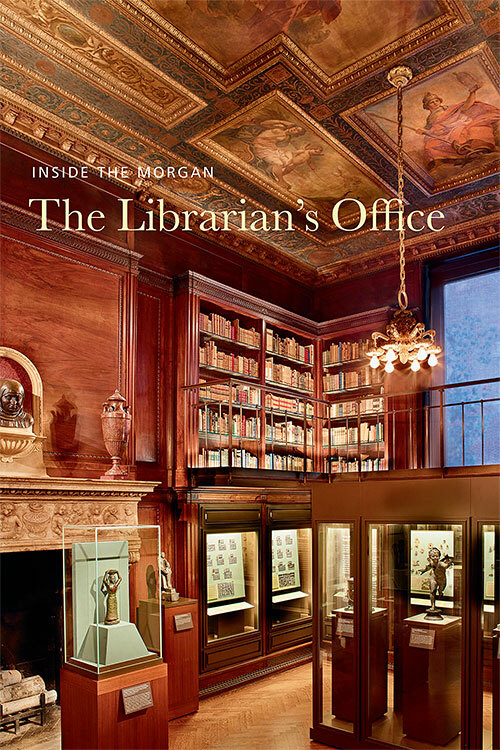 Today, Morgan's library is the historic core of the Morgan Library & Museum. One of the best preserved Gilded Age interiors in New York, it offers visitors a chance to enter the private enclave of this legendary collector. Inside the Morgan: The Librarian's Office takes us into the private offices of Belle Greene, Pierpont Morgan's illustrious librarian, and explores the creation and decoration of her behind-the-scenes realm, now displaying select treasures from Morgan's holdings of ancient Near Eastern seals and tablets, Greek, Roman, and Egyptian sculpture, and early medieval jewelry.